With the shift in global malaria management programmes from control to eradication of the disease, the transmissible, asymptomatic, intra-erythrocytic sexual gametocyte stages of Plasmodium parasites have been identified as a priority target for transmission-blocking efforts . However, optimal adoption of this strategy is currently hindered by lack of safe and effective transmission-blocking drugs . 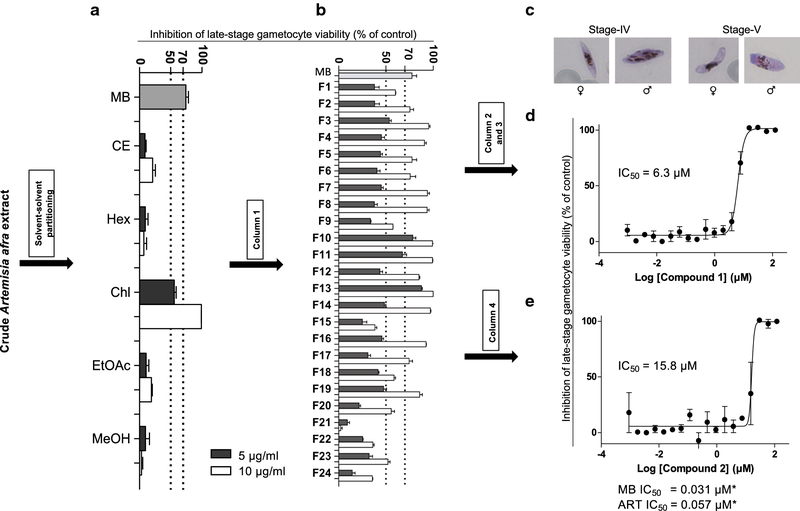 While ACT reduces gametocyte carriage, it does not have a sterilizing effect on mature stage-V transmissible gametocytes and consequently does not reduce transmission of Plasmodium parasites [8, 9]. The use of primaquine, the only World Health Organization-recommended malaria transmission-blocking drug, is severely restricted by its toxicity . This limited armoury of transmission-blocking drugs has necessitated exploration of different sources of drugs in search of novel compounds that are potent against gametocyte stages of Plasmodium parasites [11–16]. One potential vast source that still remains relatively unscrutinized in this effort is medicinal plant species . Despite the limited interrogation of plant species in search of transmission-blocking compounds, crude extracts of plants and plant-derived compounds have encouragingly been shown to be potent against late-stage gametocytes of Plasmodium parasites, both in vitro and in vivo [17–21]. Asteraceae is emerging as a promising potential candidate source worth interrogating in the search for transmission-blocking drugs, primarily because these plants produce high levels of sesquiterpene lactones with good gametocytocidal activities [17, 18, 22]. Crude water extract of Vernonia amygdalina (Asteraceae) has in vivo activity against Plasmodium berghei gametocytes with pronounced potency on microgametocytes compared to macrogametocytes . Two sesquiterpene lactones, parthenin and parthenolide, derived from Parthenium hysterophorus (Asteraceae) and Tanacetum parthenium (Asteraceae), respectively, are active against mature stage-V gametocytes of P. falciparum . Based upon this demonstrated gametocytocidal activity, there is merit in further examination of other medicinal plant species within the Asteraceae family in search of Plasmodium transmission-blocking drugs, and one species which warrants exploration is Artemisia afra (Asteraceae) . Artemisia afra is a commonly used indigenous medicinal plant species in South Africa for the treatment of colds, coughs and fever [3, 23]. Its use in the treatment of fever led to studies on its antiplasmodial properties in search of novel chemotherapeutic anti-malarial agents [24–26]. In search of a novel transmission-blocking lead, the in vitro potency of A. afra crude extract against the transmissible late-stage gametocytes of chloroquine-sensitive P. falciparum parasites was reported. However, the identity of the gametocytocidal compounds in A. afra was not determined . The present study provides a report on the bioassay-guided isolation and identification of two active compounds associated with potent gametocytocidal activity of A. afra. The agents, a recent study investigated and provided fractionation steps for isolation procedure were primarily guided by in vitro activity against late-stage gametocytes of P. falciparum as measured using the parasite lactate dehydrogenase (pLDH) assay [17, 27]. The two compounds, 1α,4α-dihydroxybishopsolicepolide and yomogiartemin, were both found to be the principal components responsible for the gametocytocidal activity of A. afra. Both these compounds fall under the guaianolide class of sesquiterpene lactones. Structurally these compounds vary in that 1α,4α-dihydroxybishopsolicepolide is highly oxygenated while yomogiartemin has two epoxide groups. 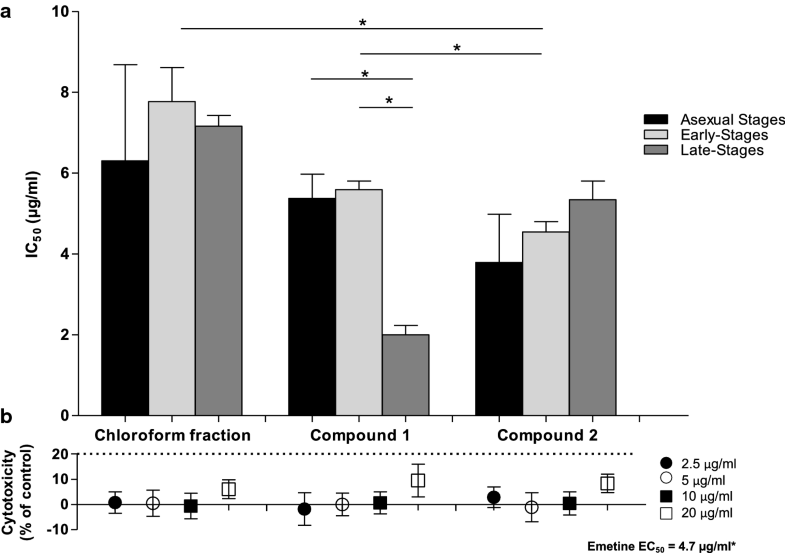 While information on the pharmacological activity of yomogiartemin is relatively scant, 1α,4α-dihydroxybishopsolicepolide has been shown to be active in vitro against chloroquine-sensitive intra-erythrocytic asexual P. falciparum (PoW strain) parasites with a reported IC50 value of 8.7 µg/ml (27.2 µM)  which compares favourably to an IC50 value of 6.0 µg/ml (18.7 µM) measured in this study for this compound against asexual chloroquine-sensitive P. falciparum (NF54 strain) parasites. The work presented in this study was the first to provide a report on the gametocytocidal activity of these two compounds. Both compounds showed good activity against early- and late-stage gametocytes with IC50 values of < 10 µg/ml. Interestingly, 1α,4α-dihydroxybishopsolicepolide was significantly more potent against late-stage gametocytes than early-stage gametocytes and intra-erythrocytic asexual P. falciparum parasites. This is consistent with a previous report showing that the crude extract of A. afra was more active against late-stage gametocytes than early-stage gametocytes . The isolated compounds were also active against asexual parasites of Plasmodium, marking them as potential pan-reactive anti-malarial drug candidates. This pattern of in vitro pharmacological activity has been observed for the sesquiterpene lactone, artemisinin, which is known to exhibit pan-reactivity in vitro [41–43]. However, artemisinin is more potent (double to single digit ng/ml IC50 values) across all three stages investigated [27, 42–44] although moderate activity of this compound and its derivatives has been reported against the mature, stage-V gametocytes (reported IC50 of > 12.5 µM, > 90% stage V) . Parthenin, a sesquiterpene lactone of the guaianolide class , and parthenolide, a member of the germacranolide class and additionally has a single epoxide ring, have both been reported to be highly potent against stage-V gametocytes . Data presented in this study along with that from other investigations [18, 22] strongly point to sesquiterpene lactones being a chemical scaffold worthy of serious consideration in development as target candidate product-5 molecules, that is, drugs prioritized towards transmission-blocking purposes . Sesquiterpene lactones have been known to exert their therapeutic effect through a number of biological activities [47–50]. Mode of action (MOA) of this class of compounds has been attributed to the alkylation of biological molecules by the α-methylene-γ-lactone group. Reported effects include disruption of ion homeostasis state, generation of reactive oxygen species and induction of apoptosis [48, 51]. Despite the known gametocytocidal activity of sesquiterpene lactones, their MOA against malaria parasites, gametocytes in particular, still remains poorly understood . However, recent evidence suggesting that interruption of mature stage-V gametocyte homeostasis is a potential MOA for some gametocytocidal drugs , does provide a clue on the potential MOA of sesquiterpene lactones against gametocytes. This may be due to inhibition of the sarco/endoplasmic reticulum Ca2+-ATPase (SERCA) pump, which has been shown to be targeted by two other sesquiterpene lactones, thapsigargin and artemisinin . Inhibition of the SERCA pump leads to elevated cytoplasmic levels of calcium leading to disruption of cellular homeostasis balance . Primaquine has been suggested to exert its gametocytocidal activity by production of highly reactive oxygen radicals leading to oxidative stress . Drug-induced oxidative stress could partly account for the gametocytocidal activity of the compounds isolated in this study, particularly yomogiartemin which contains two epoxide rings both of which are capable of producing oxygen radicals. 12936_2019_2694_MOESM1_ESM.docx Additional file 1: Table S1. Inhibition of in vitro viability of late stage gametocytes of Plasmodium falciparum (NF54 strain) by crude extract and fractions of Artemisia afra. Table S2. Inhibition of Plasmodium falciparum late gametocyte stages by fractions from column 1. Table S3. IC50 values of Artemisia afra chloroform fraction, compounds 1 and 2 on intra-erythrocytic asexuals, early gametocytes and late stage gametocytes. Fig. S1. Base Peak Ion chromatograms from UPLC-MS analysis using ESI +ve mode for fractions A) F10, B) F11, C) F13 and D) F19. Fig. S2. Full dose-response curve plots for artemisinin (ART) and methylene blue (MB) against late-stage Plasmodium falciparum gametocytes.